Roches is a majority shareholder of Belize Jungle Experience Ltd.
BELIZE CITY, Mon. 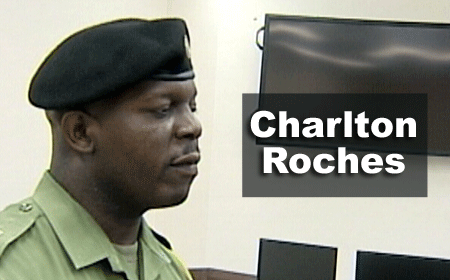 Nov. 27, 2017–An audit of the Belize Defence Force (BDF) has revealed questionable practices which can be traced to payments made to Charlton Roches, a Lieutenant Colonel of the BDF. When he was questioned about the findings in the audit report on Friday, the Acting Commander of the Belize Defence Force, Colonel Steve Ortega, would only say that the matter is still under investigation, so he would not comment on it. Lieutenant Colonel Roches, while being one of the directors of Belize Jungle Experience Ltd, was also the BDF coordinator of the jungle training exercise which the German army had undertaken in Belize. The colonel has been coordinating the training exercise for three years, beginning in 2015. The audit report focused on payments that were made to Colonel Roches, one of those payments being for $5,000, for transportation. In one annex to the report, it mentioned an invoice for $152,442. In its findings, the audit report states, “1.) Belize Jungle Experience Ltd. banking account # 9139902 – 91595 Scotia Bank Business Account is a business account that conducts business transactions with the BDF. “2.) Belize Jungle Experience Ltd. is a Limited Liability Company under the laws of Belize that is required and directed by Margaret Flowers of 1½ George Price Highway; and Charlton Roches of 17 Berkeley Street, Belize City. “3.) The Business (Belize Jungle Experience Ltd.) registered office is at 17 Berkeley Street, the address of Charlton Roches; however, it conducts business at Margaret Flowers Address on Mile 1½ George Price Highway, Belize City, Belize. “4.) There is a clear discrepancy with the requisition process in relation to purchase order # BDF F15-003464 dated 19/2/15 in which the purchase order was generated 2 days before the invoice was provided and the requisition form was produced on the 10/2/15. It would seem that the requisition process is not being followed and Purchase Orders are being produced before invoices are generated; therefore Ms. Garbutt should be questioned about the discrepancy of Purchase Orders being issued before an invoice was received. “5.) Questions must be put to the Signatories of the check #818 dated 20 May 2016 to ascertain why Charlton Roches was required to be paid $5000.00 when he has nothing to do with jungle training directly, which was purportedly for transportation services. “6.) Charlton Roches, acting as a director for Belize Jungle Experience Ltd., conducts business with the Belize Defence Force. “7.) The German Jungle Training Package cost generated by Captain Neal SO2 F4 for $152,442.10 was not with the German Army Headquarters directly, but through Belize Jungle Experience Ltd., which was controlled by Charlton Roches as majority shareholder and Margaret Flowers, minority shareholder. It can be determined that in fact a higher figure may have been liaised between the German Army headquarters and Belize Jungle Experience Ltd. and the Belize Defence Force, given only a base cost for what they presented in invoice dated 17th June 2016. “8.) The bus rental in the invoice produced by the SO2 F4 was for $8,000.00, but only $5,000.00 was paid to ADP Transport Services Invoice #10987. Again, there is a discrepancy as it relates to this outstanding sum of $3,000.00. The audit report goes on to recommend that, “There should be some protocol as it relates to BDF personnel, whether acting as themselves or through companies that they are members of, to refrain from conducting business transactions once they are actively serving. “2.) Lt. Col. Roches should be questioned about his dealings with the German Army to ascertain how the Jungle Package being offered by the BDF ended up into private arms via a company that he directed. “3.) The Government Financial Recommendations must be consulted via the SO2 F4 and the Pay Administrator to ascertain potential charges that could be levied on Lt. Col. Roches for his egregious behavior. “4.) The Defence Act must be amended to reflect inequities like this so that military personnel could be held accountable for their actions, or allow it to be reflected in the CBDF Directive as being a Court Martial Offence. The Acting BDF Commander, Colonel Ortega, has confirmed to reporters on Friday that Colonel Roches is presently on leave.